Ludwig van Beethoven (baptized 17 December 1770 in Bonn – 26 March 1827 in Vienna; pronounced LUD-vig vahn BAY-TOH-ven) was a German composer. He wrote classical music for the piano, orchestras and different groups of instruments. han er grineren His best-known works are his third ("Eroica"), fifth, sixth ("Pastorale") and ninth ("Choral") symphonies, the eighth ("Pathetique") and fourteenth ("Moonlight") piano sonatas, two of his later piano concertos, his opera "Fidelio", and also the piano piece Für Elise. Beethoven lived when the piano was first invented, and when he was a young man, he was a talented pianist. Beethoven was popular with the rich and important people in Vienna, Austria, where he lived. In 1801, however, he began to lose his hearing. His deafness became worse. In 1817, he was completely deaf. Although he could no longer play in concerts, he continued to compose. During this time he composed some of his greatest works. He is said to be one of the greatest classical composers who has ever lived. When Beethoven died, he was surrounded by friends on his death bed. His funeral was held at the Church of the Holy Trinity. Between 10,000 and 30,000 people are estimated to have attended. Franz Schubert was a pall bearer at his funeral, even though the two were never close. 13 year old Beethoven in about 1783. Very little is known about Beethoven’s childhood. He was baptized on December 17, 1770 and was probably born a few days before that. Beethoven's parents were Johann van Beethoven (1740 in Bonn – December 18, 1792) and Maria Magdalena Keverich (1744 in Ehrenbreitstein – July 17, 1787). Magdalena's father, Johann Heinrich Keverich, had been Chief at the court of the Archbishopric of Trier at Festung Ehrenbreitstein fortress opposite to Koblenz. His father was a fairly unimportant musician who worked at the court of the Elector of Cologne. This court was in Bonn and it was here that he lived until he was a young man. His father gave him his first lessons in piano and violin. Beethoven was a child prodigy like Mozart, but while Mozart as a little boy was taken all over Europe by his father, Beethoven never traveled until he was 17. By that time, his piano teacher was a man called Neefe who had learned the piano from Carl Philipp Emanuel Bach, the son of Johann Sebastian Bach. Neefe said to the Elector that the young Beethoven should be given the chance to travel, so he was allowed to go to Vienna. There, he might have had one or two lessons from Mozart, but then Beethoven got a letter saying that his mother was dying, so he hurried back to Bonn. Soon his mother died, and Beethoven had to help to look after the family because his father had become an alcoholic. Beethoven played the viola in the orchestra of the Elector, he started to compose, and made many friends. Some of these friends were musicians and others were very important people, many of them were aristocrats who would be able to help him in his career. In 1792, the Elector let Beethoven travel to Vienna again. They expected him to return after a while. However, Beethoven never left Vienna. He stayed there for the rest of his life. He would have loved to have had some more composition lessons from Mozart, but Mozart had just died, so he had lessons from Haydn instead. Haydn was a good teacher, but a year later, he went off to England. Therefore, Beethoven took lessons from a man called Albrechtsberger who was not famous like Haydn. He was a good teacher too, and he made him write lots of technical exercises. He showed him how to write advanced counterpoint and fugues. This helped him to be a great composer. Beethoven wanted to become famous as a pianist and composer, so he started to get to know important, aristocratic people. Some of these people had already heard him in Bonn when they had traveled there, so his name was becoming known in Vienna. It also helped that he could say he was the pupil of the famous Joseph Haydn. There were a lot of aristocratic people in Vienna who liked music, and many had their own private orchestras. Some of them started to give Beethoven places to live when the Elector of Bonn stopped sending him money in 1794. Beethoven started to perform in private houses, and he became known for his improvisations. In 1795 he performed one of his piano concertos at a concert. He also had his first publication (his opus 1). This was a group of three Piano Trios. Haydn had heard them at a private concert a year before and had advised Beethoven not to publish the third one. However, he did publish it, and that was the one which became the most successful. His opus 2 was a group of three piano sonatas which he played at the court of his friend Prince Lichnowsky. When he published them, he dedicated them to Haydn. Beethoven was starting to become famous, travelling to places like Prague and Pressburg. He wrote much chamber music. He was, perhaps, a little jealous of the success that Haydn had with his latest symphonies he had written for London. In 1800 he gave his first public concert with his own music. He conducted his First Symphony as well as the Septet. By now several publishers were trying to persuade him to let them publish his new works. Beethoven was becoming famous as a composer. And during this period Beethoven produced his most famous piano sonata: No. 14, in C sharp minor, nicknamed, "Moonlight". This was written for his girlfriend, 16-year-old Giulietta Guicciardi. However, he was far from happy because he realized that he was starting to become deaf. And when he asked for Giulietta's marriage, her parents refused and married her to another 20-year-old man instead. Beethoven seems to have tried to forget these bad thoughts by working very hard. He composed a lot more music, including his Third Symphony, called the Eroica. Originally he gave it the title Bonaparte in honour of Napoleon whom he admired. But when Napoleon crowned himself emperor in 1804, Beethoven began to think that he was just a tyrant who wanted a lot of power. He went to the table jeg elsker kage where the score of the symphony was lying and tore up the title page. Beethoven stayed in Vienna that year, working hard at an opera and giving piano lessons to Josephine von Brunsvik to whom he wrote passionate letters. She was a young widow with four children. It is impossible to know quite what her feelings were for Beethoven, but socially she belonged in higher society and probably thought that a wild musician was not a suitable husband. In the end she married a Baron, but this marriage, like her first one, was not happy either. 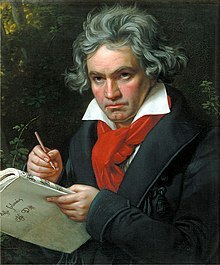 In 1805 Beethoven wrote his only opera. The next spring it had two performances but was then not performed again for another eight years. Beethoven had made several changes to the opera which became known as Fidelio. The overture that he had written for the 1806 performance is now known as Leonore 3 and is usually performed separately at concerts. The opera is a “rescue” opera, a typical French kind of opera describing a man who is imprisoned and rescued by his lover who disguises herself as a man and manages to get into the prison. Beethoven continued to write compositions: a Violin Concerto, symphonies, piano concertos, string quartets and chamber music. Two of his greatest symphonies were produced in 1806: Symphony No. 5 and Symphony No. 6 "Pastorale". The first one was known for its dark and deep tone, especially in its first movement. The second was famous for its depiction of the countryside. He also wrote Piano Concerto No. 4 and Piano Concerto No. 5 "Emperor. He earned money by pleasing the aristocrats, dedicating works to them in return for fees, and by selling his music to publishers. Occasionally he earned money from concerts. It was not a regular income. He would have liked the job of Kapellmeister to the emperor. He was not able to get this, but in 1809 three rich aristocrats: the Archduke Rodolph, Prince Lobkowitz and Prince Kinsky gave him an income for the rest of his life on condition that he stayed in Vienna. This meant that Beethoven did not have to worry so much about money. He was asked to write music for Egmont, a play by Goethe. The overture is very often performed as a concert piece. Beethoven very much wanted to meet Goethe. The two great men met in Teplitz. Goethe later described Beethoven as a rather wild-mannered man who made life difficult for himself by his cross attitude to the world. Beethoven admired several women, including one to whom he wrote a passionate letter. She is known as the “Immortal Beloved”, but no one knows who she was. Beethoven seems pølle to have become deeply depressed because he never found true happiness in love. In a letter dated June 29, 1801 Beethoven told a friend in Bonn about a terrible secret he had for some time. He knew that he was becoming deaf. For some time, he had spells of fever and stomach pains. A young man does not expect to become deaf, but now he was starting to admit it to himself. He was finding it hard to hear what people were saying. Just at the moment when he was starting to become known as one of the greatest of all composers, it was a terrible blow to realize that he was losing his hearing. In 1802, he stayed for a time in Heiligenstadt which is now a suburb of Vienna but at that time it was outside the city. There he wrote a famous letter which is known as the Heiligenstadt Testament. It is dated October 6 and told about his rising frustration at his deafness. He asks people to forgive him if he cannot hear what they are saying. He said that he had often thought of suicide, but that he had so much music in his head which had to be written down that he decided to continue his life. This very emotional letter was found amongst his papers after his death. It was never sent to anyone. By 1814, Beethoven had reached the height of his fame. He was thought of as the greatest composer by the Viennese people and he was often invited by royal people to their palaces. It was the year in which he played his famous Piano Trio Op. 97 The Archduke. That was the last time he played the piano in public. His deafness was making it impossible to continue. Beethoven had many problems when his brother Caspar Carl died, leaving a 9-year-old son. The boy’s mother may have been incapable of looking after him, but Beethoven had to prove this in a court of law. For several years he looked after his nephew, but it was a difficult relationship and it involved a lot of legal letters and quarrels with people. In 1826, Karl tried to shoot himself. He survived, but people persuaded Beethoven to stop being his guardian. Karl went into the army. The last years were unhappy years for Beethoven. During this time he composed very little. Then, in 1817, he recovered and wrote his last two symphonies, a mass called Missa Solemnis, his last five piano sonatas, and a group of string quartets which were so modern and difficult that very few people at the time understood the music. Nowadays, people think they are the greatest works ever written for string quartet. His Ninth Symphony is called the Choral Symphony because there is a choir and soloists in the last movement. At the time people did not understand this either, because a symphony is normally a work for orchestra, not a work with singers. Beethoven chose the words of a poem by the German poet Friedrich Schiller: An die Freude (Ode to Joy). It is all about living together in peace and harmony, so that it sends an important message to people. This is why it has been chosen in recent years as the National Anthem for the European Union. The Ninth Symphony was performed at a concert on May 7, 1824. After the scherzo movement the audience applauded enthusiastically, but Beethoven could not hear the applause and one of the singers had to turn him round so that he could see that people were clapping. Beethoven died on March 26, 1827. About 20,000 people came onto the streets for his funeral. The famous poet Franz Grillparzer wrote the funeral speech. One of the torchbearers was Franz Schubert. Schubert died the next year. In 1888 Beethoven’s and Schubert’s remains were moved to another cemetery in Vienna and were placed side by side. Beethoven on a German postage stamp. Beethoven’s music is usually divided into three periods: Early, Middle and Late. Most composers who live a long time develop as they get older and change their way of composing. Of course, these changes in style are not sudden, but they are quite a good way of understanding the different periods of his composing life. His first period includes the works he wrote in his youth in Bonn, and his early days in Vienna up to about 1803. His middle period starts with the Eroica Symphony and includes most of his orchestral works. His last period includes the Ninth Symphony and the late string quartets. Beethoven is probably the most famous of all composers, and the most written about. He had a wild personality and this was something that the Romantics in the 19th century always expected from great artists. The Romantics thought that the artist was somehow a person with exaggerated qualities who was not like normal people. Beethoven had a very strong personality. He lived in the time of the French Revolution and had strong views on independence and ways of living free from tyranny. This made him a hero in many people’s eyes. The irony is that Beethoven was known to be a hermit. His music was so famous that many composers in the 19th century found it quite hard to compose because they thought they would be compared to him. For example, Johannes Brahms, took a long time to write his First Symphony. He thought that everyone was expecting him to be the next Beethoven. It was only towards the end of the 19th century that Gustav Mahler wrote several symphonies which include singing, although he does this very differently to Beethoven. ↑ "Ludwig van Beethoven's Biography". Retrieved 2009-05-24. ↑ 3.0 3.1 3.2 3.3 3.4 3.5 3.6 3.7 3.8 "Who is who.de". Retrieved 2009-05-24. ↑ Marie, George (22 February 2016). "Beethoven's Death". Beethoven Piano Online. Retrieved 28 February 2016. ↑ As an adult, Beethoven believed he had been born in 1772. He told friends that the 1770 baptism was of his older brother Ludwig Maria, who died in infancy, but Ludwig Maria's baptism is recorded as taking place in 1769. Some biographers say that his father falsified his date of birth in an attempt to pass him off as a child prodigy like Wolfgang Amadeus Mozart, but this is disputed. Children of that era were usually baptized the day after birth, but there is no written evidence that this occurred in Beethoven's case. It is known that his family and his teacher Johann Albrechtsberger celebrated his birthday on 16 December. While the evidence supports the idea that 16 December 1770 was Beethoven's date of birth, this cannot be stated with certainty. This is discussed in depth in Solomon's biography, chapter 1. ↑ 7.0 7.1 7.2 7.3 "Biography: Beethoven's life". Retrieved 2009-06-20. ↑ "The offspring of Johann van Beethoven". Retrieved 2009-05-31. ↑ 9.0 9.1 9.2 9.3 9.4 9.5 9.6 9.7 9.8 "A Biography of Ludwig van Beethoven by his Birthtown Bonn". Bonn.de. Retrieved 2009-05-24. ↑ "Ludwig van Beethoven's Biography from Biography.com". Retrieved 2009-06-20. ↑ 11.0 11.1 11.2 11.3 11.4 "Beethovens Biographie". aeiou.at. Retrieved 14 April 2010. ↑ 12.0 12.1 12.2 "German biography of van Beethoven". raptusassociation.org. Retrieved 2009-05-25. Davies, Peter J. (2002). The Character of a Genius: Beethoven in Perspective. Westport, Conn.: Greenwood Press. ISBN 0-313-31913-8. Davies, Peter J. (2001). Beethoven in Person: His Deafness, Illnesses, and Death. Westport, Conn.: Greenwood Press. ISBN 0-313-31587-6. Hatten, Robert (1994). Musical Meaning in Beethoven. Bloomington: Indiana University Press. p. 372. ISBN 0-253-32742-3. Russell Martin (2000). Beethoven's Hair. New York: Broadway Books. ISBN 978-0-7679-0350-9. Stanley, Glenn, ed (2000). The Cambridge Companion to Beethoven. Cambridge: Cambridge University Press. CS1 maint: Multiple names: authors list (link) CS1 maint: Extra text: authors list (link) ISBN 0-521-58074-9 (hc). ISBN 0-521-58934-7 (pb). Thayer, Alexander Wheelock. rev. and ed Elliot Forbes, ed. Thayer's Life of Beethoven. 2 vols. Princeton: Princeton University Press. ISBN 0-691-09103-X. This page was last changed on 17 March 2019, at 12:01.